How It Works: ZP-515 Heavy Fuel Treatment dissolves hard carbon formations such as lacquer, gum, varnish and wax which are derived from the partially burned hydrocarbons in the fuel. This promotes the release of rings and valves, increasing the engine’s RPMs and brake horsepower. ZP-515 Heavy Fuel Treatment is recommended as a cleaning action for fuel injectors to remove foreign matter that can ruin the spray pattern and proper combustion. ZP-515 Heavy Fuel Treatment helps with the elimination of water, corrosion, bacteria, fungus and sludge from the fuel system preventing the clogging of fuel filters or fuel injectors. This means less down time and expense for filter or nozzle changes. ZP-515 Heavy Fuel Treatment provides these benefits, yet is nontoxic, non-caustic and contains no alcohol. When fuel spray patterns are altered, the fuel will not be mixed with the air as efficiently as designed, and will not burn completely. The result will be smoke, unacceptable emissions, and carbon deposits on the fuel injectors. This carbon will eventually bake on hard and cause further distortion of the spray pattern. Where carbon deposits have occurred, ZP-515 Heavy Fuel Treatment will soften and eventually remove them. The removal of the hard carbon deposits is one of the reasons for the reduction of smoke emissions when using ZP-515 Heavy Fuel Treatment. Lower quality fuels may have a high level of hard to burn residuals, including asphaltenes. These may burn incompletely, even if the spray pattern is optimum. The exhaust particulate from this type of fuel can be very sticky and will adhere to exchanger tubes and exhaust stacks. If these are not cleaned out from time to time, overall system efficiency will decrease and fuel costs will increase. ZP-515 Heavy Fuel Treatment will help the fuel to burn more completely and will take some “stickiness” out of the remaining exhaust particulate. As a result, the need for frequent exhaust system cleaning is reduced. Users report that high sulfur fuels conditioned with ZP-515 Heavy Fuel Treatment produce less SO2 exhaust emissions and cause less acid corrosion of the exhaust systems than untreated fuels. What To Expect: ZP-515 Heavy Fuel Treatment is a multipurpose fuel conditioner. It is a unique, concentrated blend of petrochemicals formulated specifically for today’s lower quality fuels. ZP-515 Heavy Fuel Treatment makes low quality fuels burn better while reducing CO, NOx and particulate (smoke) emissions. There have been numerous indications that ZP-515 Heavy Fuel Treatment also reduces sulfur-related problems when using high sulfur fuels. It removes and prevents hard carbon, a prime cause of reduced power and engine wear. It prevents growth of bacteria and fungi that contaminate diesel fuels, disperses sludge and water, stabilizes fuels and protects fuel systems from corrosion. ZP-515 Heavy Fuel Treatment also improves the lubricity of fuels. Users routinely report noticeable improvements in operations and reduced emissions after they add ZP-515 Heavy Fuel Treatment to their fuel. Performance efficiency is restored to new levels with reported average reductions of 10% in fuel consumption and 15 to 25% in maintenance costs. 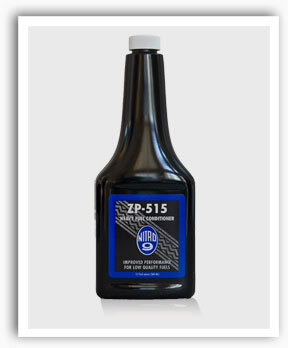 ZP-515 Heavy Fuel Treatment is compatible with all engine, filter and fuel systems. It is non-toxic and non-caustic, contains no metals or alcohol, and requires no special handling. It is guaranteed to contain no chemicals that would damage any fuel system.